There are so many things that pet parents have to take into consideration when it comes to caring for their furry family members. You want to ensure that your pup receives the very best of care, and one of the best ways you can do that is by offering him a well balanced diet. There are literally dozens of dog food brands on the market that contain premium quality ingredients and are specially formulated to meet the nutritional needs of dogs. One of the most trusted brands is Merrick. 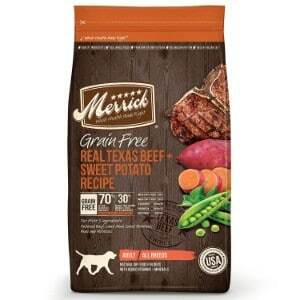 Since 1988, Merrick has been one of the most trusted manufacturers of dog food. They offer a wide array of formulas for dogs of all shapes, sizes, breeds, and dietary needs. All of their recipes contain the highest quality ingredients and are packed with vitamins and minerals that canines need to thrive. Now that you have had a sneak peek at our top five Merrick dog food choices, let’s take a closer look at each one. Below, we provide a more detailed analysis of each formula, including the ingredients that they feature, what we like about them, and what other pet owners who have used these five products have said. Once you have read through the reviews and selected the option that you think will best meet the needs of your four-legged family member, click on the buttons to find the best prices currently available on Chewy and Amazon. If you’re looking for a dry dog food that is packed with nutrients, free of grain, and tastes great, too, then you and your pooch will love Merrick’s Grain Free Dry Dog Food Real Texas Beef and Sweet Potato recipe. This formula is completely gluten free, so if your dog has a sensitive stomach, he’ll be able to digest this with ease. If he has a gluten sensitivity, this dog food won’t aggravate him, either. The first ingredient in this formula from Merrick is real Texas been, which has been carefully deboned. This high protein dog food will help your dog build healthy, lean muscles to keep his musculoskeletal system in-check. Additionally, it’s completely free of poultry products, so if your pooch has a sensitivity to chicken or turkey, you will be able to eat this formula from Merrick with ease. Other ingredients include a variety of farm-fresh fruits and vegetables, such as blueberries, sweet potatoes, peas, apples, and more! It’s also been infused with essential nutrients, including amino acids, omega 3 and 6 fatty acids, calcium, vitamins A, B, D, and E. Most customers say that their dogs love the taste of this Merrick formula, and feel as if they are offering a dog treat, as well as a well balanced meal. Final Verdict: Whether you are looking for a grain free dog food, a dog food for sensitive stomachs, or a dog food for allergies, Merrick Grain Free Dry Dog Food Real Texas Beef and Sweet Potato has you covered! This formula is 100 percent grain free, offers a high protein content, and contains easy to digest carbohydrates, so it’s safe and will meet the nutritional needs of all pups. Maintaining a healthy weight is vital for the overall health and well being of your furry best friend. Carrying around excess weight can cause a number of issues, including joint and cardiovascular problems. Therefore, if your pup is packing on the pounds, it’s important to offer him a specially formulated dog food for weight loss. With Merrick’s Grain Free Healthy Weight Recipe, you can not only help your pooch shed those unwanted pounds, but you will also be able to ensure that he is getting the vital nutrients that he needs. This formula offers the perfect balanced of protein and fiber without the added calories that many other dog foods contain. Fewer calories leads to healthier weight. Just like all other Merrick formulas, their weight loss recipe features real meat as the first ingredient. In this recipe, the protein is sourced from premium quality beef that has been carefully deboned. It also contains a bevy of natural fruits and vegetables, including blueberries, apples, sweet potatoes, and potatoes. On top of all of that, this formula also contains flaxseed oil, organic alfalfa, salmon oil, and a wide range of vital nutrients that your dog needs to thrive. Most pet owners say that their dogs love to eat this food, and they are very pleased with the weight loss results that it offers. Final Verdict: Overall, we think that Merrick Grain Free Healthy Weight Recipe is a fantastic choice for maintaining the healthy weight of a dog. The reduced calorie content helps to shed pounds, while the high calorie and nutrient content provides well balanced nutrition. While some users did report that they didn’t notice any difference in weight, that is likely because they were feeding their dogs’ more than the recommended amount. 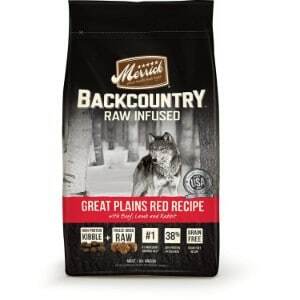 If you are a pet owner who is looking to feed your dog a raw food diet, but you aren’t very keen on the idea of feeding him actual raw chunks of meat, then Merrick’s Backcountry Grain Free Dry Dog Food is a great option to consider. This dry dog food formula is infused with raw kibble, making it a high protein dog food that your pet will be sure to love. Not only is the taste very palatable for dogs, but the high protein content from natural animal sources will ensure that his bones, joints, and muscles are strong. Protein is the first ingredient in this food, which includes venison, lamb, and buffalo. Those who want to offer their canine companions food that mimics what ancestral dogs ate when they hunted and foraged for themselves will find that Merrick’s Backcountry Grain Free Dry Dog Food is the closest thing they can get to raw without having to cut up chunks of meat. In addition to the high protein content, this formula also contains a wealth of other essential vitamins and minerals, including amino acids, manganese, copper, vitamin D3, vitamin B12, vitamin A, calcium, folic acid, glucosamine, iron, and more! In other words, by feeding your pooch this food, you can rest assured that he will be receiving the well balanced nutrition that he needs to thrive. Final Verdict: Overall, we were very impressed by Merrick Backcountry Grain Free Dry Dog Food. We found that the high quality protein sources and the high nutritional content of this dog food is a great options for all breeds, including German Shepherds, Great Danes, Golden Retrievers, Labrador Retrievers, Poodles, and any other breed; mixed breeds, too! Puppies have different dietary needs than adult dogs. Therefore, if you have a puppy, it’s important to feed him a food that is specially formulated to meet his unique nutritional needs. 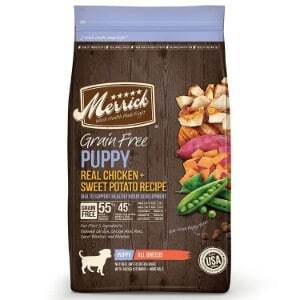 Merrick Grain Free Puppy Recipe Dry Dog Food is a great choice for your growing dog. As always, real meat is the first ingredient, and in this formula, that protein is sourced from deboned chicken. It’s also completely grain free, so there is no need to worry that it will cause any adverse reactions. To ensure that your puppy pal is receiving the nutrition that he needs, Merrick has infused this recipe with DHA for healthy brain development. It also contains a range of nutrients, including omega 3 and omega 6 fatty acids, glucosamine, and chondroitin to ensure that all of your pooch’s vital systems are being nourished as he is growing. Farm fresh fruits and vegetables, including sweet potatoes, blueberries, carrots, and peas are just some of the additional natural ingredients that are used in this puppy formula. Highly recommended by veterinarians and animal nutritionists as a well balanced diet for puppies, you can rest assured that your pup will be receiving the very best nutrition with this Merrick formula. Final Verdict: If you have a puppy in your family, then Merrick Grain Free Puppy Recipe Dry Dog Food is a great option to feed him. It features all of the essential nutrients that your young pooch needs to grow and thrive into a health adult dog. It’s highly recommended by veterinarians, animal nutritionists, and pet parents, too. 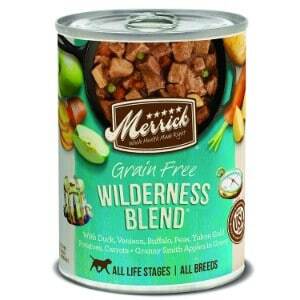 The last recipe from Merrick on our list is their Grain Free Wet Dog Food. If your pooch is finicky and doesn’t like dry dog food, then feeding him a premium quality wet dog food, like this option from Merrick, is a great option. Some pups simply prefer the texture and taste of wet food and find that it is more palatable than dry foods. With this formula from Merrick, you can rest assured that your pooch will love the flavor, and you can have peace of mind knowing that his nutritional needs will be met. As with all of the dog foods that Merrick makes, this wet food formula features real protein as the first ingredient, which is deboned salmon. It’s also completely grain free, like all of the other products that this manufacturer makes. Real fruits and vegetables, including apples, sweet potatoes, carrots, and peas, are just some of the other ingredients that are offered to create a well rounded, wholesome meal. And of course, it contains all of the essential nutrients that your pooch will need. Made for all life stages and all breeds, it’s a great food for small dogs, food for large dogs, food for puppies, and senior dog food, too! Final Verdict: A wet food that is formulated to meet the needs of dogs of all ages sizes, you can rest assured that your canine companion will receive the very best nutrition when you feed him Merrick Grain Free Wet Dog Food. It contains the highest quality ingredients and most dogs love the palatable flavor. Your dog looks to you to provide him with all of the care that he needs. That’s why you go to great lengths to ensure that you are offering him the very best products you can find! He has the best possible dog crate to keep him protected, a dog bed that he can rest in comfortably, a dog playpen that will keep him safe when you can’t keep all of your attention on your furry pal, a dog house that will shield him from the elements outside, and an outdoor dog kennel that he can enjoy runs in when you can’t strap him into a dog harness for a walk. Of course, in addition to all of these products, you want to ensure that you are filling his dog bowl with the best quality food possible. There are tons of dog food options on the market, which makes it hard to choose the best product to meet the needs of your pup. 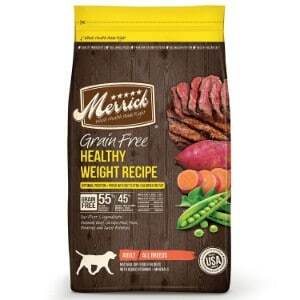 One of the most highly regarded pet food manufacturers around is Merrick. In fact, they have been trusted for more than 30 years! But if you’ve never fed your pup Merrick, you probably want to know a little bit more about the company before you decide to go ahead and feed it to your furry family member. In this section of our review, we shed more light on this highly regarded dog food manufacturer so that you can decide if it’s the right choice for your pup’s needs. Merrick first game on the pet food scene in 1988, and at the time, they were a small company that specialized in natural dog treats. But over the years, they become more invested in offering pets the premium quality dog food that the need to meet their nutritional needs. Merrick’s philosophy is simple: they believe that dogs should be fed the best possible food. To that end, all of the products they make contain natural ingredients that are sourced from local farmers and most reputable suppliers. Additionally, all of their ingredients are approved by the FDA and other agencies that ensure the quality of pet food. Put simply, Merrick is one of the highest quality dog foods on the market today – and for the past 30 years! When it comes to selecting food for your pet, you want to ensure that you are choosing a product that has an outstanding reputation and is fully committed to crafting the absolute best quality foods. That’s exactly what you will get when you choose Merrick. Protein that is sourced from real animals and is carefully deboned to ensure the safety of your pet. The meats they use include chicken, turkey, salmon, lamb, pork, venison, buffalo, and more. Protein is always the first ingredient in all of their recipes to ensure easy digestion, great taste, and maximum nourishment for their joints and bones. Natural fruits and vegetables are mixed into every type of Merrick dog food. This produce is provided by local farmers and includes things like sweet potatoes, peas, carrots, blueberries, apples, green beans, and much more! These natural fruits and vegetables further infuse their food with the vital nutrients that dogs require, and also help to further enhance the flavor. All Merrick products are infused with essential vitamins and minerals, such as glucosamine, zinc, phosphorus, B vitamins, vitamin A, vitamin E, vitamin D, omega fatty acids, amino acids, and many more! In addition to the prime ingredients featured in each Merrick dog food recipe, every formula is completely grain free. You’ll never find things like corn, soy, or any other difficult to digest grains that could cause adverse reactions in your pooch. Furthermore, there are absolutely no artificial flavors or dyes, preservatives, additives, or fillers used in their products. As a pet parent, it goes without saying that you want to ensure that your family’s furriest member is receiving the very best of care to ensure his health and well being. When it comes to the food you feed him, there are many different options available, but Merrick is, hands-down, one of the best manufacturers on the market. All of their products are grain free, contain protein sourced from real animals, and contain natural fruits and vegetables. They are also fortified with all of the essential vitamins and minerals that dogs need to flourish. Whether your dog is a puppy, an adult, or a senior, and whether he is large or small, you will have confidence knowing that his dietary needs are being met with Merrick dog foods. Merrick offers several different formulas. While we feel that the five options listed in our review are the best on the market, any product Merrick product that you choose will be sure to offer your pooch the nutrition that he needs. To sum it up: Merrick will be sure to make both your pup – and you – happy! What about real chicken, peas & ancient grains?